I start by concealing the eyes with my holy grail concealer Prolongwear by Mac, my shade is Nc25. I then like to pick up a brown colour for the crease so the finish will be well blended. On this look i went for Brown Script by Mac. Then to add the smoke to the look i take a little bit of Inglot 63 which is a matte black into the crease & a little bit on the outer corner of the eye. Last eyeshadow is a washed white by Mac called Blanc Type ( my fav. lid colour ) on the lid. 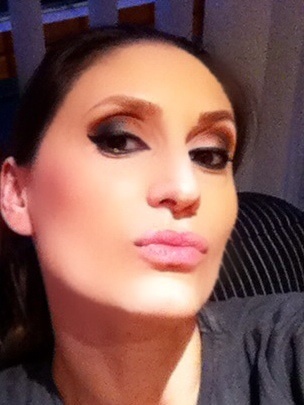 Next i used Mac Smolder on the waterline & again a bit of Inglot 63. The eyeliner used is by Collection 2000, a felt tip one which i picked up one time when i was running low & never used anything else since. We are now ready for black Lashpower Mascara by Clinique. Let me know what do you think!? I am a new blogger with a huge passion for make up. Open for ideeas & questions.